Luckily, this same research group looked into the use of privacy curtains treated with antimicrobial agents and had encouraging findings. Use of such curtains delays and reduces contamination, which can increase time between washing curtains and decrease infection transmission. These curtains are the new must-have for hospitals, clinics, and physicians’ offices. 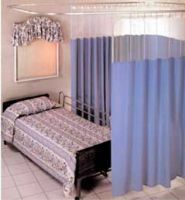 Our Sundance Antimicrobial Privacy Curtains ensure patients’ privacy and safety. They are commercial-grade cubicle curtains treated with an antimicrobial agent that inhibits the growth of bacteria. Don’t let the technical description fool you; these panels will blend with any interior design theme and are available in 12 fabric colors with 11 coordinating mesh colors. The fabrics are machine washable or dry clean, and flame retardant. Our Privacy Cubicle Curtains are built to last. Their durable, quality construction can stand up to the rowdiest patients and toughest charge nurses in a hospital, clinic, care facility or lab environment. These privacy curtains have a triple thick 1.5 inch header reinforced with a middle layer of nylon mesh, and feature grommets of two-piece, rustproof, nickel-plated brass on 6-inch centers. Safe-T stitching in hems and seams makes them practically tear-proof. These panels can be mounted on our Privacy Cubicle Curtain Tracks, which are available in heavy duty, ceiling mount, and flexible track options. We would be happy to help you select the right curtain for your needs; give us a call at 888-434-7444. That's amazing! I never knew that such a thing existed!